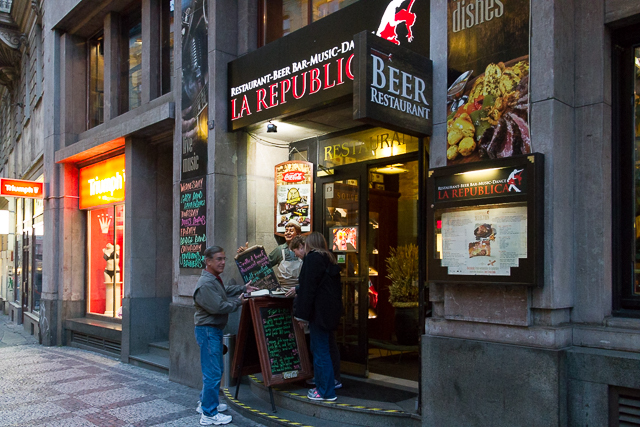 La Republic Restaurant, Prague | Should We Go There? This was our first day in Prague and we had no idea where to go for dinner. The folks at the front desk recommended La Republic, so armed with only a small torn map, and no water in our canteens, off we went. The restaurant was only a few blocks from our hotel and was very easy to find. As you can see from the images, the entrance was very inviting with their menu and specials posted outside. Inside, the place was great…. well, in my opinion. There is an upper level with additional seating, but we sat on the main level because my legs just couldn’t take any more stairs. 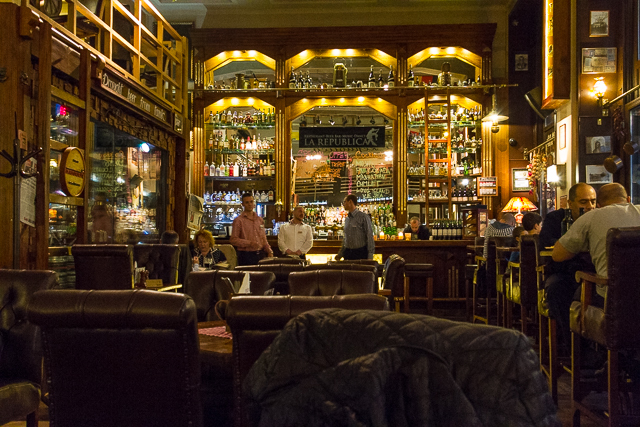 As you can see from the image, it’s a very ornate place, especially the bar. You really need to try the Czech beer; it’s light and flavorful. Now, the food. One person, my wife, had pig’s knuckle, and three of us had wiener schnitzel. Not only were the dishes excellent, but also massive. Each dish was almost a meal for two. The wiener schnitzel was perfectly done and the pig’s knuckle fell off the bone. One thing I was beginning to realize was that a salad in the US is different than a salad in Prague….. Europe for that fact. I ordered a salad and got a small bowl of lettuce with a cherry tomato cut in half. Do you use salad dressing? Not in Europe you don’t. The standard is a little oil as the dressing, no flavor but really slippery. Oh, how I dreamed of home………… ranch, creamy garlic……. sorry, I got carried away. The only issue I had on a personal level was my wife. We both grew up with the “clean plate club”, “children are starving in China”, that kind of thing. So in the end it really didn’t matter how much I ate because by the time she was finished “eating”, her plate was clean, tis was because she kept putting her food on my plate for me to “try”. If you looked at my plate, I should be the skinniest person on the face of the earth because it looked like I didn’t eat any of my pig’s knuckle, uh excuse me, I ordered the wiener schnitzel. This place is definitely worth a try. I didn’t mention prices. Have you read some previous posts? Do you remember “Prague prices”? Well, Prague prices are alive and well here. VERY inexpensive, and well worth the money. It’s a definite five on the “Glenn’s good food – I’m full, good beer – I’m not thirsty, I need to walk” scale. Images and additional information is listed below. Enjoy. And, thanks. Sun: 9:00 to 11:30 p.m.
November 2, 2014 in Restaurants.